Note: New users should directly check out TumblThree. Over the last week I reverse engineered TumblOne by Helena Carver. The project is under Public Domain and thus free from copyright. Since there was no source code available and I always wanted to see how easily one can decompile .NET assembly and wanted to add new features, I thought I would give it a try and reflect it. Bonus: I've never touched C# before and this way, I could learn a new language on top. There are other people on the projects discussion page that suggested similar features and since the development seemed stalled, I thought about releasing the code and the binary with my changes, thus probably also under public domain. I don't want to take over the original project, nor infringe any copyright or claim fully authorship. So, if the original author wants to continue her project, I'd be happy to help and see my changes committed. For the meantime, I thought of a fork for the changes and a new project name. TumblTwo is an image downloader (crawler) for the Bloghoster Tumblr.com based on TumblOne. After supplying a url, the application will search and download all types of images in a given resolution. It's possible to download only tagged images and download simultaneously from multiple blogs and enqueue others. To use the application, simply copy the url of any tumblr.com blog you want to download the pictures from into the textbox at the top. Afterwards, click on 'Add Blog' on the right. To start the crawl process, click on 'Crawl' on the right. The application will regularly check for (new) blogs in the queue and start processing them, until you stop the application by pressing 'Stop'. So, you can either add blogs to the queue via 'Add to Queue' first and then click 'Crawl', or you start the crawl process first and add blogs to the queue afterwards. You can set up more than one parallel download in the 'Settings' on the right side. Also, it is possible to change the download location and the sizes of the pictures to download there. You can also download only tagged images by adding tags in a comma separated list in the tag column of the blog list in the top. For example: great big car,bears would search for images that are tagged for either a great big car or bears or both. multiple simultaneous picture downloads of a single blog, customizable in the settings. As an alternative, each picture is downloaded successively. multiple simultaneous downloads of different blogs, customizable in the settings. possible to download tumblr.com hosted videos. it is possible to download images from blogs only for specific tags. a clipboard monitor that detects http:// .tumblr.com urls in the clipboard (copy and paste) and automatically adds the blog to the bloglist. a download queue for blogs. a detection if the blog is still online or the owner has changed. the blogview is now sortable and shows more information, e.g. date added, last time finished and the progress. a settings panel (change download location, turn picture preview off/on, define number of simultaneous downloads, set the imagesize of downloaded pictures). Somewhat overhauled user interface which is resizable, faster and saves and restores its settings. Source code at github (Written in C# and WinForms). This is probably going to be the last release. New icons as it has been requested by the author of TumblOne. I am not the author nor owner of the website tumblone.com and not responsible for the content of this particular site. The image preview now applies its visibility settings upon startup. Since we have to pre-crawl all image urls for the parallel image downloading, we now use its count for better progress indication instead of the total blog post count, which might contain double posts of the same image (seems to happen a lot), text, videos, etc.. Some images were reloaded even if they were already downloaded since we have saved the full url and checked for duplicates using it. If the file however was hosted on a different mirror, the application would redownload the same file and increase the counter for downloaded images even if it was already downloaded. Finally, the program should work quite nice for everyone now I hope. Get rid of the progress indicators in the button as they are too troublesome for multiple blog downloads and provide similar or better information in the blog list at the top. Set a maximum degree of parallel downloads to prevent connection timeouts and connection closures from tumblr.com which appeared on my site after around 6,000-10,000 images. The crawl seemed stalled after a while, then finished before downloading all images. I've set the value to 50 20 and they are divided by the number of parallel blog downloads in the settings. When you crawl multiple blogs at once, you might have to adjust this value in the settings as it depends on your bandwidth. Thanks for the email regarding this issue! Further integrated the versions. The parallel crawl is now the default and integrated in the main TumblTwo.exe. You can switch to the old, serial download method in the Settings. Integrated the beta (tags) version into the main version, so no more "beta" right now. You add tags in the main blog list as comma-separated list e.g. : great big car, bears would search for images that are tagged for either a great big car or bears or both. Tags are saved and get reloaded if the blog was crawled for those once. Just clean the tags column to search for all images again. Clicking the picture preview in the bottom right corner opens a fullscreen preview. Upon clicking it, the normal view returns. I did a two day code cleanup to enhance and someday remove the wonky User Interface. The new versions aren't compatible with the previous ones yet. the blogview now saves the column order, width and so forth. The Columns can be reordered. the blogview progress is now under layered with a progressbar. Probably more i already forgot. I am going merge the tags (beta)-version into this one and someday will come up with a new interface after reorganizing the code further. I just thought this might be a good intermediate version/step (for newcomers) as the UI should be more stable now, and the old versions are still here for download (since the data files are not compatible yet). Further enhanced the parallel versions. We now generate an url list of all images in parallel and after its competition crawl in parallel over all images. At least here it vastly increases bandwidth, but the image downloads won't start until all image urls are fetched.. Get them here: Windows Application (.exe) (~248 kb) [GPG sig] - Windows Application (.exe) (~248 kb) - Beta [GPG sig]. It's now possible to download photosets. Added a detection if the blog is still alive and/or if its the same blog. Therefore we use the HTML Title and the blog description. I wasn't sure if the title would be enough, since many blog titles are simply equal to the url, which might not change if the owner the blog changes. Thus, I'm also taking the description into account, but I'm not sure if they frequently change. So, I'm happy about any input in the comments/per mail about this if we're generating too many false positives. A more parallelized version for single/few blog downloads can be found here: Windows Application (.exe) (~248 kb) [GPG sig] - Windows Application (.exe) (~248 kb) - Beta [GPG sig]. I haven't yet much time to test it, but maybe it's worth a try if you don't download multiple blogs at once. The picture preview might lag/show nothing and the "stop/pause" won't come at once since we "batch" download up to 50 images, but otherwise it should work. Added a process percentage column in the Blogview (no fancy progressbars yet). "Delete Blog" now deletes only the index file and removes the blog from the view, but does not delete any downloaded images. It's now possible to import TumblOne-Blogs by simply addind/moving the proper .tumblr files from the Index folder of TumblOne (which is also located inside the \Blogs\ folder which holds your downloaded pictures right next to where the TumblOne.exe is located) into the Index folder of your download location set in the 'Settings' window in TumblTwo. The blogs will be added but will be showing a "not yet crawled!". Thats okay, because we use a different counting mechanism. After starting the first crawl, the proper index will be adjusted. Some fixes for the progressbar. Some minor UI code changes and cleanup. Added a Clipboard Monitor. Enabled by default, can be turned off in the mainwindow on the right side panel. Once turned on, if you ctrl-c or copy any text which contains one or more Tumblr blog urls, the blogs will be automatically added if they don't exist. Beta release (Not really well tested yet). Crawl only specifically tagged images. Crawl only specifically tagged images by specifying the tags in the Queue Window in a comma separated way. I.e: Aston Martin,ferrari,Porsche. Consequently, the Blog is crawled for any image that matches the given tags. To do so: add the desired blog to the queue, without starting the crawl process. Now click in the cell next to the blog with the column header Tags for crawling. Enter your tags in a comma separated way, finish with enter. Start the crawl. If you don't bother about tags, simply don't add anything to crawl the whole blog. Fixed threading wonkiness. Sometimes, the queue still got depleted from idling tasks after pressing 'stop'. Adjust the number of simultaneous downloads without a necessary restart of the application, if the number of threads is not smaller than it was before and if the crawl process is not currently running. Make sure the download location is always correct (trailing backslash) to fix the "The current blog cannot be saved to disk"-bug. Now saving the windowsize and its position. Large Speedup for startup times and resuming of blogs since we now catalogize all downloaded filenames together with their URLs in a small single index file, instead of checking for all single downloaded image files in the download folder at startup and which is now also used for duplication check. This should improve speed drastically. Also, its now possible to safely remove images out of the \Blogs\"MyDownloadedTumblrBlogFolder"\ without rendering in download them again, as long as you keep the .tumblr (index) file in the Index folder. This opens the way to a backup function. Specifying the number of Posts in each blogs. Might be equivalent to number of pictures, if the blog only contains pictures. 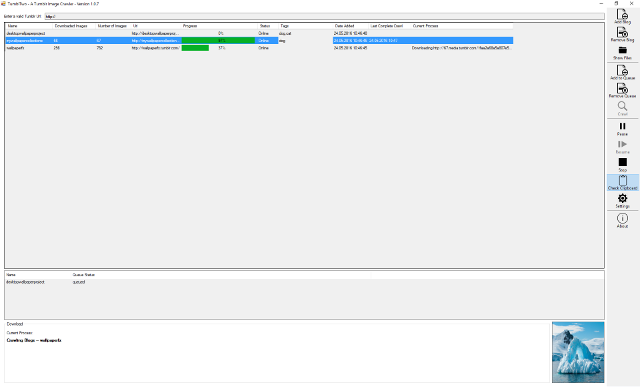 Added Multiselection in the Blog and Queue View. To add multiple blogs at once to the queue, select the blogs with the ctrl-key or shift-key pressed, then hit "Add to Queue". Same for removing, just in the "Queue"-view and hit "Remove Queue" (Thanks to Torn for suggesting this!). add a 'expiration date' to crawl only newer images in specific blog -> Partly done: You can simple recrawl all blogs, as long as you keep the Index (.tumblr) files, only newer images will be downloaded, since all images (the download url and the filename) are catalogized in the index file. No redownload occurs. option to automatically remove blogs when crawling is complete. batch input of tumblr blog urls from text file -> We check the Clipboard for URLs now. Simply ctrl-c your text file. import blog index files from TumblOne. 'backup function' for blog indexes -> Check your Downloadlocation\Index\ folder and save the appropriate .tumblr file for your specific blog. Download only specifically tagged files. allow to download videos files. I'm completely new to C# and (safe)-threading programming and if anyone wants to help, feel free to commit. So, beware of the code ;). I'll add source code annotations over the next few days and the first git commit is the pure reverse engineered TumblOne code without any modifications from my side. Source code at github.com (Written in C# and WinForms). Gee thanks! I've been waiting for queue functionality for so long. Gonna give a test drive. Hey! This is awesome that you have forked this wonderful program. Thank you! When attempting to remove a blog, the following error occurs: "Could not find a part of the path 'F:\TumblTwo\Blogswallpaperblog'." It looks like there's a missing '\' in the error. "Current Blog cannot be saved to Disk! Be Sure, that u have enough Memory and User Permission..." The drive I'm using has 195+GB free. I'm going to look into that this evening and i'll notice you about any improvements or further needed help.. Fixed. The FolderBrowserDialog returned a path without trailing backslash. Sorry for that amateurish bug, i probably didn't test the paths well enough. Should be fixed now and working. I have more than 200 blogs and manually click 200 times for adding to queque after restart of programm. Okay, sounds like a good idea.. I'll add that :). Shouldn't be too complicated at all..
your are the best man on the Planet !!! Might work now. Maybe you can give it a try and test it a bit.. Thanks !!! it is 100% super work! Please, make "Select ALL", "Multiselection" ещ Queue. I have more than 200 blogs and click 200 times to add to Queue after restart application. I have a suggestion/feature request for removing progress bar and last grabbed image when blog crawling is finished when "show images" option is checked, as it's not quite clear if the job is done or still being active. Also, when updating large blogs (30000+ images) the program freezes for a few minutes while retrieving new files. I'll look into the freezes over the weekend and the other thing should not be too complicated. Maybe we can rearrange the code a bit so that it runs fast for people that don't want any progressbar/picture preview at all..
Maybe I'll come up with something this week. The Import is easily possible now. As for the backup, you may simple save your .tumblr files in the Index folder of your download location. Hello! It is possible to write index files (./blogs/index/*.tumblr) immediately after crawling is finished, not on exit? This way the completed blogs will be marked as grabbed even in case of application hang/crash. That's definitely possible and an easy fix. I'm going to add thisthis week, probably tomorrow. Fixed, thanks for your tip! Fixed, thanks for your tip! It's certainly necessary now since we save much more in the index files. We save it now after a finished crawl, on exit or pressing stop. I hope thats enough..
Hi. I'm new to T1 and just found out about your T2, haven't even tried it yet - it's 3:30 am, gonna try it tomorrow. But I have already few suggestions to T1 so they coud be good also for T2. 1. Don't know if that's a bug but T1 can be opened several times - that is actually a multidownload. I've read that you featured multi in T2 but from the screens I assume that progress bar is only one for all downloads. I'm already used to many bars as I put every other instance of T1 over another so the bars are visible only - keeps better control over your downloads, imo. 2. I've checked the possibilities of T1 by removing some of downloaded images from one blog and by recrowling - T1 just dowloaded again the missing files. Good option but there should be also onother one which allows to update the blog by downloading only new images. This seems easy doing - dowload should stop after checking that image already exist on disk. This could be also an automated process - simple add an option UPDATE with choices "now/on startup" "all/selected blogs". and CRAWL would just download again all missing images. That's all for now, not so many suggestions as I thought, probably forgetting something. Gonna check T2 tomorrow. Almost forgot - good job so far, keep up the good work. Thanks for the good work, it doesn't seem to be running properly on my computer. After adding the tumblr link and clicking crawl, no image would be downloaded no matter how long I have waited. The program is not hung, I can still click on the buttons. But nothing it shown on the bottom where it says current process and current url. It is not .Net issue, I had that before when running tumblone, so I installed it and replaced the mscoree.dll file with the current version. Tumblone is working properly. I thought it was my laptop's issue, so I tried it on my desktop, same problem occurs. Any thoughts? Did you add your added tumblr link to the queue at all? Unlike TumblOne, it's not enough to simply press crawl, you also have to specifiy which blogs to crawl by adding some to the queue from the upper list by selecting any of them and press "add queue". This is a really cool application. I am glad someone carries on the torch of TumblOne. 1. Set a date to limit old images from being download again. Use case: download the blog once, clean up & deleted uninteresting ones. Download again would make the deleted ones to come back. 2. Allow setting HTTP proxies (instead of relying on system IE proxy settings, which affects all windows applications). Thanks for your suggestions. I think those are really useful. Work has been quite time consuming lately, but starting with next week, I already plan to decouple the GUI more from the code to fix the input lags/crash with large imagesets and to reflect the multicrawling better (multiple progressbars). I'll try to add your suggestions too! PLEASEEEEE ADD A TAG BUTTON SO WE CAN SPECIFICALLY DOWNLOAD THE ONES WE WANT PLEASE!!! How do you mean, tag button? How do you mean, tag button? By selecting those in a browser?! I see, thanks for the tip. I've added something. You might want to give it a try..
And to the "Current Blog cannot be saved to Disk! "-Error, i've also changed to code to make sure that the path is always vaild. You might have to choose or enter the path of your download location again in the Settings-windows. Maybe that might help. Please, add video download function! It would great to dwnload video from blog too. "Current Blog cannot be saved to Disk! Be Sure, that u have enough Memory and User Permission..." Im using windows 10 with 1tb hdd any help? thanks!! Hi, can you add an option to crawler larger photos than 1280? Yes, of course. I didn't know you could upload larger image sizes without rescale than 1280px width, but actually, i'm not soo the tumblr guy (didn't know about the tags either ;) ). I can add a function to try to download in general the largest possible picturesize to make it future proof. Right now, its actually doing so hardcoded with the 1280pixel width, but to make sure..
Could you give me an URL to a blog with larger than 1280px images? I did a quick search, couldn't find one right away.. Thanks. I'll see what i can do..
TumblTwo is not valid win 32 application . is it only compatible with Win 7 or higher ? Nice Major Update, but still few errors. First of all, BIG THANKS for your efforts, time & energy on this project. TumblOne was good, but had been abandoned. I've been searching for a replacement but always came up short with finding a better alternative. I have over a TB of free space. I ran them in admin mode to fix that. None of them were able to find the path specified in the settings, therefore they wouldn't attempt to crawl any blog. The fix for this was to manually add an Index folder, "F:\TumblTwo\Index\Blogs"
c) After adding a blog to que, then crawling it, it shows that it has grabbed images, but it isn't creating the folder to that blog. However, I do see a tumblr file, "newblogscraped.tumblr"
d) Actually, this was my first error on 1st run. The above is due to me attempting to (save a ton of time) place TumblTwo where TumblOne is and set the same save directory so that I can easily import the pre-existing blogs that had been scraped by TumblOne to prevent from having to re-download all those blogs again. There is a few more features, but I'll cut it short here. I'd be glad to donate to get the wheels rolling on this a lot sooner. Thanks alot for your exhaustive comment! I tried to fix a) - d), you may give it a shot now and report back if it still doesn't work. And for the video support, and also for larger images support as suggested by Torn, Alex, and James. it is doable, i already wrote some code to download self hosted videos from tumblr, which was easy, but then i figured out that often the majority of videos are actually embedded youtube video. Then again, you have to completely parse the youtube website. So, maybe it's worth adding support for youtube, flickr and some popular sites, but then again there will be some sites that wont work, and it's a whole lot crap of work. Like writing a jDownloader for images. Maybe there already is some code / library around which already does it,.. So, long talk put short: I'm not sure about it. It's a lot of stuff to do to make that properly work, and still it will probably never work for every single site (i.e. video, larger image).. Sounds like its going to be a pain importing old tumblr blogs into the newer versions, reason being is cause TumblOne never used the ".tumblr" files that TumblTwo is using. I can not find those files located anywhere, and that is from 3 different instances of TumblOne (I wanted to scrape faster so I ran multiple instances with different save directories). Any possible work around for this since tumblone doesn't generate .tumblr files? The files should be in your \Blogs\Index\ folder relative to your TumblOne.exe file. So, the \Blogs\ folder contains folders for all your downloaded Blogs where the pictures are inside as well as a single folder called Index with the .tumblr files. Sorry, I forgot 1 last (minor) request. You've done a great job with times tamps and updating the change logs. Could you also update the tumbltwo versions so that we can easily keep track of which version is which? fixed broken queue function (sorry, didn't test it enough after the last changes). Speedup for resuming on large blogs. Ok, gave the new versions a test run, here are my findings & suggestions. It appears that after crawling a blog last image, the progress bar stays up as if its still trying to crawl. Only way to know if its done crawling a blog is to check the "last crawled tab"
Multiple progress bars would work just as well if that is more quicker & easier to implement. Hey, I would like to have your email so that I can discuss a few things with you privately. - instead of listing the blogs being crawled, or in addition, maybe highlight them in the main list or show a flag beside them. And biggest request of all....allow the import /conversion of TumblOne index files for existing crawls that may need updating. Please try the new version, it should work now without the use of a shortcut or setting things to "Windows XP compatible mode" as someone suggested here. Thanks for reporting! I'll add your suggestions! Another suggestion, similar to the clipboard idea: automatically import all those blogs being followed. Thnks for your hard work! Is it me or tumbltwo only download the first image in a post, i mean a post with multiple picture in it. Is there any work around it?